A second version of the 54 Loomis Street proposal was unveiled on Wednesday. David Cerundolo, the owner of the property explained that he had owned the existing building for close to 20 years. Until recently Pharmalucene (which has since moved to Billerica) had leased the building. Once Pharmalucene left, David begun to explore redeveloping the site. This new version contains close to 3,000 square feet of retail (up from 1,000) on the ground floor along with 28 apartments (down from 30). According to the owner, the apartments would be 1 and 2 Bedrooms. As far as the building itself, the footprint is about 12,000 square feet (total square footage is around 36K - 12K per floor) which is pretty similar to the existing building. With the very high vacancy rate for office space in Bedford and surrounding areas (around 20%), it probably makes more financial sense to redevelop the property for retail and housing (Pharmalucene leaving left several buildings vacant on Loomis Street and DeAngelo Drive). The increased retail space would probably be enough for several small stores. With the traffic from the bike path and local area it would be interesting to have a small ice cream or coffee shop. Chipotle Mexican Grill is coming to Bedford. The restaurant will be located at the old Friendly's location at 343 Great Road. The restaurant is expected to also have outdoor dining. More details should be available soon. Fast Casual Mexican has been growing in the area. Last year a Chipolte opened on Mall Road in Burlington (old Dandelion Green location) and just last month a Qdoba opened next to Stop and Shop in Lexington. This restaurant should do very well in Bedford. Fast Casual Mexican is something that has been missing in Bedford. It looks like a Frozen Yogurt Store is coming to the Blake Block. According to the Massachusetts Corporations Division, a company was recently formed under the name Wicked Good Frozen Yogurt LLC at 80 Great Road. While the name of the actual company is Wicked Good Frozen Yogurt, I'm guessing that the store may be a franchise for one of the national Frozen Yogurt Chains. Again just a guess. With most of these stores, your given a large cup, you select the Soft-serve Yogurt you want from a selection of Self Serve Yogurt Dispensers and then add toppings if desired. It's then weighed to determine the price. 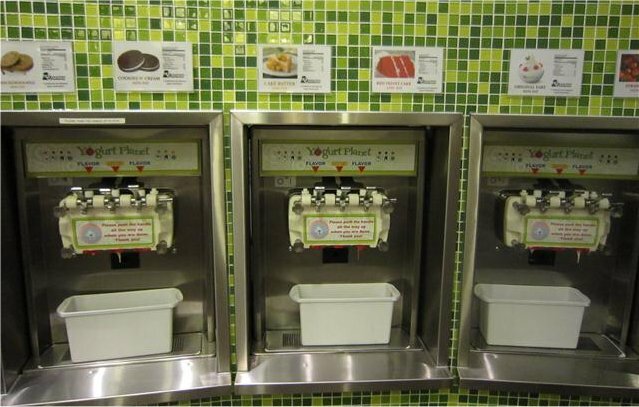 An example of Self Serve Frozen Yogurt machines. You select the flavor(s) you want. The past year have seen a large number of new Frozen Yogurt Stores. Yeh! Yogourt Glace and Café recently opened on Mall Road in Burlington while Lexington Center has added a Orange Leaf Frozen Yogurt. This new Yogurt Shop will be located near Bedford Farms which offers both Ice Cream and Frozen Yogurt. Attracting the High School kids after school will be a key factor in it's success. Offering a place to hang out (i.e. Couches and WiFi like many Starbucks) will probably be beneficial. There is a new Fast Food/Quick Service Restaurant planned for the old Friendly's location at 343 Great Road in the Great Road Shopping Center. Friendly's closed back in January shortly after filing for Chapter 11 Bankruptcy. The new restaurant is expected to be a national Quick Service Restaurant (QSR) chain and will include some outdoor seating. It will not be a Panera Bread (which was originally expected to open after the Bedford Marketplace renovations which are currently on hold). According to Conviser Property Group which manages the Great Road Shopping Center, the lease is still pending. I'm expecting the name to be announced once the lease agreements have been completed. If I had to guess on what the restaurant would be, I would say Qdoba or Chipotle Mexican Grill.